Buller extended their lead in the Pink Batts Heartland Competition when beating Horowhenau Kapiti 19-12 in Westport on Saturday. 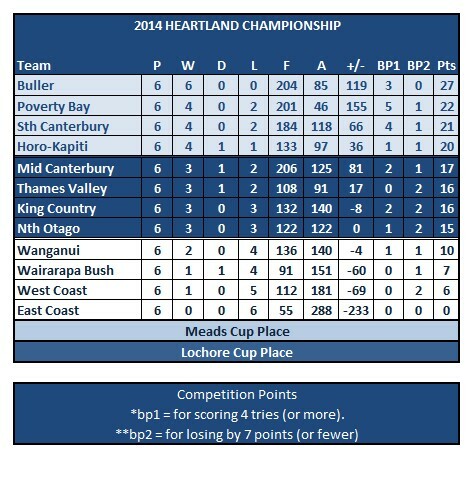 Buller have 27 points, five more than Poverty Bay who beat King Country 35-29 in Gisbonre while South Canterbury, in spite of a 19-22 loss to North Otago sit in third place on 21 points. Wairarapa Bush 20 (Ben Aoina, Sam Monaghan tries; Aoina 2 con, 2 pen) bt Thames Valley 18 (Brent Ranga, Blake Hill, Reuben Leask tries; David Harrison pen).